Most major agricultural areas experience a drought at some point or another. For example, California experiences them on an alarmingly frequent basis – and that state supplies nearly half of all vegetables and 75 percent of all fruits grown in the United States. 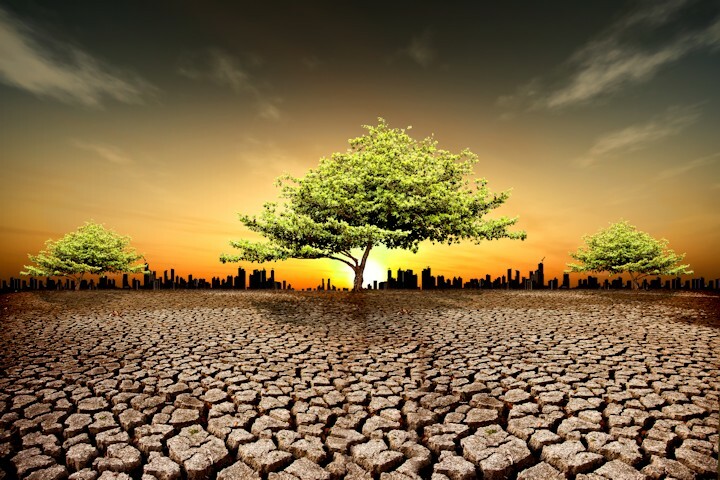 When an area is under a drought, vegetarians and vegans are at a distinct advantage – pound for pound, vegetables consume less water to produce than meat. However, it’s to everyone’s benefit to eat drought-friendly when the areas that supply our food are cutting back on water usage. When speaking about how much water a food takes to produce, fruits and vegetables come out on top as the clear winners over meats. When calculating the amount of water needed to raise an animal for slaughter, the amount of water the animal drinks isn’t a sufficient indicator of how much water is actually used: you also need to factor in the amount of water needed to grow the crops that the animal eats. When you think about it, it’s no surprise that meat production consumes more water than fruits and vegetables. While actual figures vary based on region and farmer, the results are usually staggering. For example, producing a pound of bacon costs roughly eight times as much water as it does to produce a pound of asparagus. Even though vegetables are more drought-friendly than animal products and by-products, some still require more water than others do. And when every drop counts, you want to choose the vegetables with the lowest water footprint. Surprisingly, leafy greens fare pretty well on water usage. Cabbages and other brassicas, kale, spinach and lettuce aren’t big water hogs. Brussels sprouts are drought-friendly fare, as are cauliflower and broccoli. Carrots and turnips, in addition to being vitamin powerhouses, are drought-safe, so munch with abandon. Tomatoes and tomato products are generally okay, too, but watch out for dried tomatoes, which consume large amounts of water to produce due to the machinery used in the dehydration process. Potatoes are also drought compliant, requiring very little water to produce. If you’re looking to add a little flavor to your diet, onions are also drought-friendly. Eggplant, pumpkins and squash are drought-safe and provide an interesting taste and texture variation from the usual vegetables. Cucumbers, which seem like they might be water-needy because of their high water content, are also drought-safe. In general, fruits require a little more water to produce than vegetables, but they still aren’t as water-intensive as animal products. Some of the worst offenders, like plums and cherries, are high in their water usage, but don’t let that dissuade you from adding some sweetness to your diet. If you like berries, you’re in luck. Strawberries, raspberries, currants and cranberries are all highly drought-tolerant fruits that you can eat with a clean conscience. Blueberries and gooseberries are considered fairly low in water usage, but aren’t quite as low as the others. Tropical fruit lovers can rejoice. Crops like pineapples, papaya and even mango are drought friendly. Since they’re native to hot climates that don’t always see a lot of rain, they’re used to going without water and don’t require much during cultivation. One surprising fruit that’s drought safe is the watermelon. Like the cucumber, the pulp is high in water content, but it requires very little during the growth process. If you rely on nuts for the bulk of your protein, you might be disheartened when they make the news due to their water needs during a drought. While it’s true that nuts like almonds and walnuts require a lot of water to produce, it’s all relative: even eating a full pound of walnuts doesn’t strain the ecosystem as much as eating a pound of hamburger. Even so, some nuts are more drought-friendly than others are. Chestnuts and pistachios are less thirsty than cashews, which along with almonds, require the most water to produce. Beans and other legumes are another important source of protein for vegetarians and vegans. If you want to choose drought-friendly foods, steer clear of the usual black beans, pinto beans and kidney beans. Instead, opt for some broad beans, horse beans or chickpeas. Everyone’s favorite, the lentil, is fairly water-intensive, but the nutritional value might outweigh the costs. Since water usage varies considerably from farmer to farmer, growing your own vegetables is a sure way of knowing how much water your food supply is using. If you’ve got the space and inclination, you can plant a drought-tolerant garden to ease up on your grocery bills. Choosing your plants depends on your location. What might require less water in the Pacific Northwest region could tax water rations in the southwest. For best results, consult with your local extension office or master gardener program. They can steer you in the right direction.